WASHINGTON, DC - (FACEBOOK: The Comedy News) - Health inspectors have condemned and evicted the National Archives Building in Washington, DC due to excessive hoarding. "When we walked in the Archives building, it smelled like mothballs and gymsocks," said DC Health Inspector Daniel Tanner. "Everywhere you look, there were black and white photographs of Civil War-era debutantes, to-do lists dating back to 1776---and an irrationally elaborate security system to keep anyone from stealing this old, stinky, faded junk---it was sad and with all due respect, pathetic, to see such rampant hoarding." A team of health inspectors in haz-mat suits reported that over 4.5 million documents, microfilms, and photographs were being hoarded in the 76-year-old building. "Ever wonder what happens when the Congress passes a bill?" Questioned Health Inspector Tanner. "Those piles of paper come to this building to just sit, collect dust, and rot. Although not very many Acts of Congress have been added to the pile of hoarded paper in the last 10 or so years, the Archives staff seem be delusional enough to think that people actually have a use for all this Government junk ---all saved up in this here building." 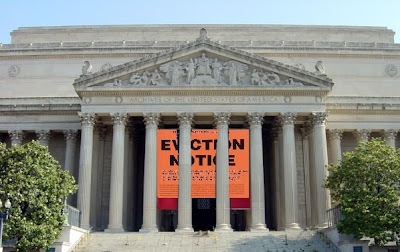 A 30-by-30-foot orange banner was hanged from the Corinthian pillars at the Constitution Avenue entrance of the National Archives. It reads, "Eviction Notice---Warning Some of the Rotting Contents within These Premises Are Almost 800 Years Old. Do Not Enter." According to the deranged curator of the condemned Archives building, somewhere in the pile of hoarded Government documents is a very significant document about a conspiracy to assassinate President John F. Kennedy which he refused to show anyone until the year 2017.